WHEN RAYMOND McNamara’s consultant told him a day before his cancer surgery that a robot was going to remove his kidney, he immediately thought it was a joke. But that all changed when the 60-year-old Janesboro man was wheeled into the theatre and introduced to the four-armed Da Vinci robot last October. 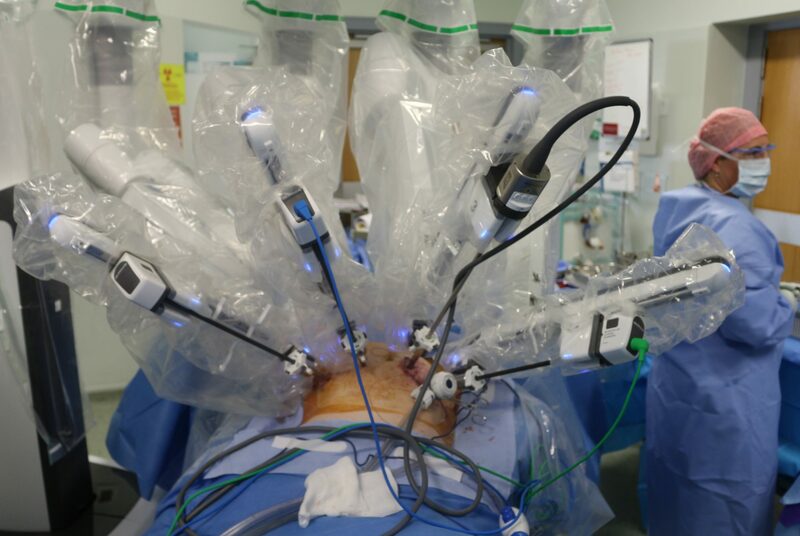 The Da Vinci Xi dual console surgical robot — the only one of its kind in the Irish public health system — is the latest medical technological innovation that can operate on the most complex of cancer sites. So far, the robot has operated on approximately 90 patients from all over the country since it was first docked in June 2016. And Raymond was one of the first patients to go under its knife for kidney cancer. On the morning of September 10, Raymond was crossing the road on O’Connell Street to his workplace Don O’Malley and Partners, when the first symptoms of his life-changing illness “came out of the blue”. Presuming that it was an infection, Raymond started his course of antibiotics, and was told to report back to the GP if the symptoms hadn’t cleared up by that Friday. But the symptoms and the agony grew worse, day by day, and climaxed that Thursday, he says. “I had to go to the Regional that Thursday, the pain was so intense. I couldn’t go to the toilet as blood clots were after forming. I found out much later on that the kidney was leaking blood because the tumour was after growing so big that it was ready to pop. And if it did pop, I would have been goosed,” a calm Raymond explains. After spending a number of days at UHL, the patient thought that he was on the mend and ready to be discharged, until the registrar broke the bad news. He admits that the first thing that went through his mind was his brother, who passed away at the age of 59. He adds that his his wife Mary, his two daughters and son also thought the worst at the beginning, but the registrar was able to put them at ease and explain his treatment. Even then, he did not know that he was going to be on the operating table, with a man-controlled robot shadowing over him. And then Raymond was wheeled into the operating room, where he met the Da Vinci surgical robot, who has been nicknamed “JP”, after billionaire philanthropist JP McManus. The robot, which cost €2.6m, was donated by the JP McManus Benevolent Fund in early 2016. Once the facility is docked, it is then operated by a maximum of two fully-trained surgeons in a separate console or room, who can make minimally invasive 8mm incisions via the robot. After a successful nephrectomy — the complete removal of a kidney — Raymond had a speedy recovery, and was back to work within a number of weeks in November. If this had been carried out without the aid of a robot, the period of convalescence could have been two to three times’ longer, he reckons. The proud grandfather-of-four says that there could have been a different outcome if he had not received the initial symptoms on that morning in September. He says that he is equally grateful for the “brilliant timing” of JP the Robot’s arrival at the Dooradoyle hospital. “I was extremely grateful. I owe an awful lot to ‘JP’, as I like to call him. It is a tremendous facility. “The people who get to use that machine are extremely lucky, and if they were sitting here today, I am sure they would be saying the same thing. I am just delighted that it was there, it was just brilliant timing,” he says with a smile. And after being given a new lease of life, Raymond was able to celebrate his 60th birthday with his family just last month.